Boyzone frontman Ronan Keating thanked fans in Belfast as the band played their final concert in the city. Standing before a packed SSE Arena after receiving a rapturous welcome on to the stage on Wednesday night, Keating said the band had never expected the success they have had. “Who would have thought 25 years ago, we certainly didn’t,” he told fans. “To have had the career that we have had, the amount of albums that we sold, the journeys that we were on as individuals and collectively, it’s been one hell of a ride. 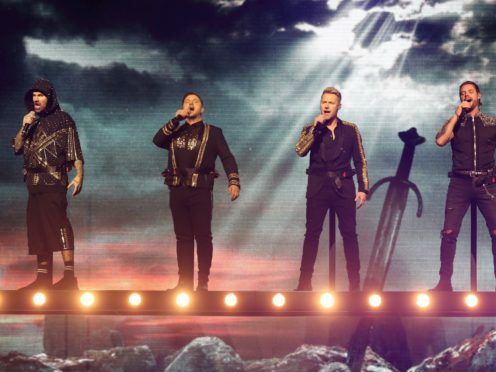 Screams erupted around the arena as the lights dimmed just before 9pm, and their volume increased as Keating, Keith Duffy, Mikey Graham and Shane Lynch were lowered on to the stage. It has been a long and glittering path for the band, who as fresh-faced teenagers played pubs in Northern Ireland in the early 1990s before getting their big break when they were signed by Polygram in 1994. There was excitement on social media earlier on Wednesday as Keating was photographed landing at Belfast City Airport. The fans who gathered in Belfast on Wednesday night ranged from the younger ages who would never have seen the band in their chart-topping prime, to the more mature original followers. Keating paid tribute to all the fans. “We have got a room full of mixed people, we have got people who have been with us for 25 years, we have got a lot of new faces and new ears in the room who have joined us in the last five or six years, thank-you very much,” he said. The gig was tinged with sadness at the absence of the late Stephen Gately. Gately died in 2009 at his home in Majorca from an undiagnosed heart condition. A brief film in tribute to him was played during the concert, recalling how he “never stopped singing morning, noon and night”, and how full of love and fun he had been. Gately’s familiar voice was heard in Belfast on Wednesday night as one of the band’s newest songs, Dream, which features his vocals, was performed. Last November the band, now aged in their 40s, released what they have described as their final album, Thank You & Goodnight, and also announced a final tour to mark their 25th anniversary. They split up to the heartbreak of their fans in 1999 before making a very successful come back in the late 2000s. Now they insist 2019 is the end. Graham told media in Dublin earlier this week that this is “definitely the end” for Boyzone. They will head south for Thursday night’s performance at the 3Arena in Dublin before setting off across the United Kingdom.